A glass frit blend pendant made from a colored mix fired in a glass fusing kiln, the pendant can be made from either all COE 90 or all COE 96. This is a very simple construction with two layers placed over a colored frit blend and then fully fused. The pendant is made from clear fusing glass and a frit blend. Frit blends can be purchased or you can make your own by breaking and mixing some scrap pieces. It needs to be medium texture to fuse properly. 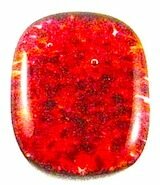 Frit blends used by bead makers are ideal for this project and offer a wide variety of mixes and colors. Cut two pieces of to size, about 1 x 11/2 inches overall will make a nice compact item. Take one piece of clear and place it on the thinfire paper, draw an outline of the piece on the paper. This forms the border for the blend. Pour enough mix onto the paper to fill the drawn outline, use a small brush to push the mixture inside the lines. Stack the clear pieces on top of the mixture and place in the fusing kiln. Push any loose pieces back under the clear layers before commencing the firing process. The above photo shows the cap and mixture ready for fusing. There in no need to use a schedule for this project. Bring item up to the required temperature fairly quickly. Hold at this temperature for about fifteen minutes, when fully fused switch off kiln and allow to cool to room temperature. Fit a pendant bail to rear of item. A variation of this process is to place the mix on top of the clear layers and fuse at a slightly higher temperature to allow the mixture to melt and flow across the surface. This technique will produce a more blended finish.